On 17 April 1942 a force of twelve Lancasters from 44 Squadron and 97 Squadron carried out a daring low-level daylight raid against the M.A.N. diesel engine factory at Augsburg in southern Germany. The six Lancasters of 44 Squadron were attacked on the way to the target by fighters and only one aircraft flown by Squadron Leader John Nettleton made it home. The 97 Squadron Lancasters avoided the fighters but were badly hit by the flak defences on the run-in to the target. 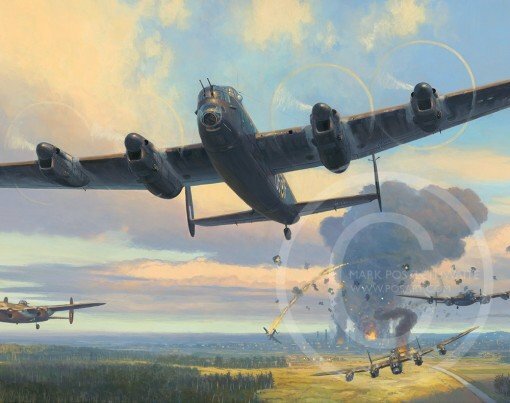 This painting portrays the 97 Squadron aircraft leaving the target with the leader, Sqn Ldr Sherwood’s Lancaster going down in flames below Flt Lt Hallows, (far left) and Flt Lt Rodley (foreground). In the background, Flt Lt Penman leads Fg Off Deverill’s badly damaged Lancaster (far right) away from the target as the third aircraft in their section flown by W/O Mycock falls in flames in the distance. Despite all being damaged, the four surviving Lancasters completed the 1000 mile return journey safely. In reality, the second section bombed a few minutes later than the first section to avoid the blast from the delayed-action bombs and so at this point would have been further away in the distance. However, they have been brought forward in the picture to help tell the complete story of 97 Squadron’s contribution to the Augsburg Raid.